Since publishing my article on how to organize a large product backlog, I got a lot of questions from readers that wanted more details on the workflow and how to set it up in Trello. That’s why I decided to create a set of template/example boards that you can copy to your own account and tweak as you wish, as well as a sort of FAQ from a couple exchanges I had with readers. 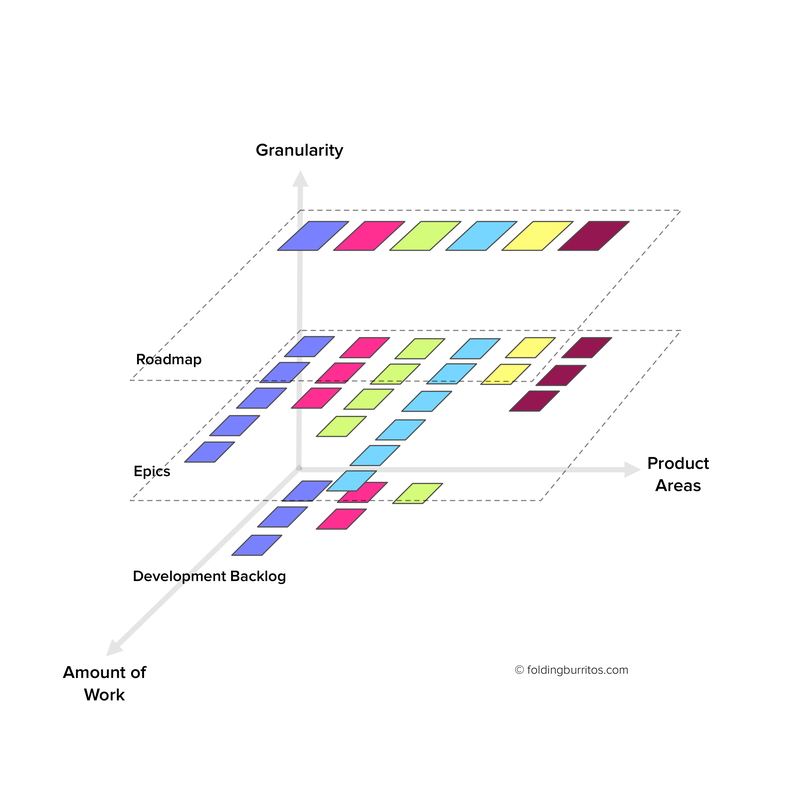 The granularity of visualization – an initiative on the roadmap has multiple epics and each its own user stories, but they all refer to the same thing, they’re just at different levels of detail. We can create a Trello workflow that supports these 3 dimensions to keep our sanity whilst managing a large product backlog. This workflow and set of boards is heavily inspired by the one used at UserVoice (albeit simplified), and I encourage you to read that article as well. At each level, priorities go from left to right, top to bottom. Go ahead, explore them and copy them into your own Trello account so you can tweak them. In these examples, we’re managing a photo service with a backend, mobile apps and web frontend. Specifications and user stories are far from exhaustive (it’s just a very relatable example domain). The idea with these templates is to show you how the different pieces fit and how you could adapt them to your own team. Although we’re using Kanban, it’s not necessary for this kind of organization to work; the main goal is to provide different levels of analysis and to avoid managing your backlog as a simple list. Over time I’ve gotten some questions surrounding this workflow that make sense to share here. I’ll keep this list updated as new ones come up. How does engineering time get prioritized between Kanban & Engineering? Negotiation. Say I’m pushing for some new feature, the team will then tell me if we need to work on some tech debt first. Sometimes it may also come directly from the team during our daily meetings: “this area is becoming / can become a problem due to our growth. We should address this.” As PM, I will then try to understand the issue and give the go-ahead in terms of priorities. It all depends on the situation but we trust each other and make sure that everyone’s on the same page regarding the tradeoffs of doing or not doing something at some point in time. Do you prune the sandbox? Do bugs flow into your sandbox? The official backlog is composed of the Roadmap, Epics, Engineering and Kanban boards. Any other supporting boards are out. All of what I’ve explained is in flux and we keep tweaking it as we go along. But the basis has been this for some time now, with great results. Do you have to check off items in the roadmap or is that automatically updated when items get moved in the kanban board? Yes, I have to check them off manually. I tried looking at Zapier or IFTTT integrations, but none had the triggers I needed (something like: “when a card gets moved to another list, check the checklist items where it’s included.) For now, it’s just a manual task I do periodically as I follow up on the status for each work item. What columns do you have in your Engineering board? The Engineering board is managed by the team. Columns usually are technical areas of the product, and cards represent work that should be done on each, or that they’d like to do sometime. They are also prioritized as they see fit. What about design tasks? Is that just done during In Progress using a “Design” card? When actual development moves forward, there’s of course some communication that needs to happen between the Dev and Design team, but that goes on “our” Kanban board. What about research/analysis tasks for PM? I usually work off Todo items I keep in Things or from Sandbox cards. What’s the purpose of the Blocked list? It’s there to show stuff that is blocked on third parties and action should be taken by someone. Having it visible forces attention to this problem and that why it’s placed after the Backlog and before the In Progress board. On our daily meetings, we review each blocked item and check if it’s ready to be worked on again. When it is, it should be higher priority than anything on the Dev Backlog.